National Drama success – CAPA College (Creative and Performing Arts College)…excellence in Arts training & education. CAPA College were thrilled to be selected to perform in the prestigious Connections Festival at the National Theatre on Saturday 30th June 2018. Over 200 schools and youth theatre companies across the UK participated in the regional stage of the festival with 12 being selected to transfer their performance to the National Theatre’s famous Dorfman Theatre. CAPA College were selected to perform ‘When they go low’ by playwright Natalie Mitchell, an engaging, comical and emotive play that so effectively explores issues surrounding gender equality. The whole process was such an inspirational opportunity for the CAPA College Performing Arts and Production Arts students to work with, and learn from, an incredible team including the CAPA College resident directors and designers and the National Theatre team of directors, fight directors, designers, technicians, producers and playwright. 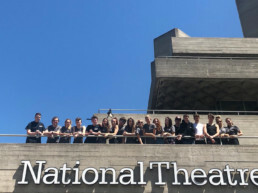 This was such an incredible and memorable experience for CAPA College students to perform at the highly esteemed National Theatre on London’s South Bank.